I've held bond funds in my portfolio but they've underperformed my stocks by a large margin and failed to provide stability to my portfolio. As I prepare for retirement and more passivity in my portfolio management, I plan to become a better investor particularly in the realm of diversification. Understanding bonds is an essential part of this process and so I've begun to delve into this area. The coupon rate is the interest rate paid on the bond. Nearly all bonds have a coupon rate. For example, if I purchase a bond with a face value of $1,000 and coupon rate of 1%, then I'd earn $10 annually by holding this investment. In Step by Step Bond Investing: A Beginner's Guide to the Best Investments and Safety in the Bond Market (Step by Step Investing Book 3) , author and Chartered Financial Analyst (CFA) Joseph Hogue explains that — prior to the advent of electronic payments — bondholders received a coupon book when they purchased a bond. Investors presented coupons to the issuing organization to request payment of interest at predetermined intervals. Though coupon books are no longer issued, the “coupon” term remains. However, bond issuers may reference an interest rate rather than a coupon rate. A bond's maturity is the fixed time from its issuance until the face value is repaid as a lump sum. A bond's maturity could be any time period, such as one year or five years.In some cases, a bond is “called” prior to its maturity. That is, if the bond has a callable provision, the issuers can pay the lump sum earlier than the originally designated timeframe. The face value of a bond is the original price of the bond as indicated on the “face” of the bond. For example, the bond issued at $1,000 with a coupon or interest rate of 1% has a face value of $1,000. Generally, when the bond comes to maturity, I'll receive the face value of the bond as a lump sum payment. I've combined these terms because they all reflect a pricing relationship to the face value of a bond. Par value is the face value of the bond. Discount and premium describe the relationship between the current price and par of the original price (face value). In many (but not all) cases, bonds can be bought and sold (traded) on the open market or secondary market. When they are available for trading, bonds may be priced at a discount below par or a premium above par. For example, a bond with a face value of $1,000 available for $900 is selling at a discount; the same bond available for $1,100 sells for a premium. Note: Typically, the reason a bond trades at a price different from its face value is a movement in interest rates in the open market (e.g., interest rates on a bank certificate of deposit-CD or savings account). Bond interest rates are fixed but market rates fluctuate. If market interest rates increase, holding a bond with a lower fixed rate becomes less attractive than putting money in a savings account and the trading value of the bond falls. Similarly, if market rates fall, then fixed rates in a bond become more attractive, increasing the bond's value on the open market. Some bonds are designed to sell at a discount (less than face value). Typically, these bonds don't pay interest at regular intervals like the bonds sold with coupons. Instead, buyers receive both interest and principal payment at maturity. There are two main ways to invest in bonds: 1) purchase new issues when they are released or 2) buy existing bonds released in the past but now traded on the secondary market. The secondary market allows investors to sell bonds when they need cash or want to get a better interest rate on the bonds being held. The presence of this marketplace means that I can buy and sell existing bonds at a discount or premium. In this way, my investment returns depend not only on the coupon rate or interest rate but also on the discount or premium. Whatever the price when I buy, the face value remains and I should receive that amount when the bond matures — unless the borrower or bond issuer defaults. The safety of the bonds are often embedded in the type of bonds I buy. U.S. Treasury bonds are considered the safest as they are backed by the U.S. government. However, higher safety generally means less risk and lower rates. According to Fidelity, corporate bonds are often assigned credit ratings by agencies such as Standard & Poor's, Moody's, and Fitch. Government agency bonds may also receive scores.High credit ratings (such as AAA) are assigned to bonds issued by organizations with strong creditworthiness and lower ones (DDD) to those in default. Periodically, ratings are updated to reflect current conditions. Bonds with ratings below BBB are considered risky and are classified as high-yield or junk bonds. 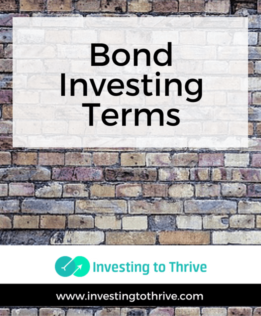 Understanding these basic bond investing terms has helped me better understand bond investing concepts. As a result, I have a deeper understanding of how to approach placing bonds in my portfolio.